HJS Studio Darn Those Socks! If you've ever put the time into handknitting a pair of socks for yourself or someone else, only to find holes in the socks later on, this article might be useful. It took me a couple of tries to get the hang of darning socks, but it's a good skill to have if you want to prolong the life of your precious handknitting, particularly if you've also handspun the yarn. Give it a try! Do it in the spring, before you put your clean wool socks away for the summer. Do it in the summer, on one of those lazy days as you bask in the sun. Do it in the fall, getting ready for blustery winter days. Do it in the winter, to keep your tootsies toasty during chores. Do it as soon as you see the first thin spot, or you'll be seeing holes shortly! Ironically, I don't have any holey socks to illustrate this tutorial with. However, an old pair of barn mittens got yet another hole (inspiring the new mittens pattern) and I've photographed the darning process step by step. First thing: Inspect socks regularly--ie, every time you (or your SO) put them on! A tiny one stitch hole is so much easier to fix than a gaping 20 stitch hole (yes, I've repaired both--bet you can guess which I prefer to work on!). I've learned to reinforce areas that look thin (you can see skin through the fabric of the sock) before they have a chance to actually break. Much easier! Yarn: What yarn should you use to darn with? If I have spun the yarn for the sock, put some effort into making it a quality sock yarn, and it wore reasonably well, then I use that yarn for darning, too. I usually have enough left over, stored with lavender in a ziplock plastic bag. If I didn't spin the yarn for the sock, then I either use the same commercial yarn to mend it, or I substitute better quality handspun. I find it doesn't make much sense to use the yarn a sock was made with if that yarn doesn't stand up to much wear. Mending over a mend is doable, but not my favorite way to spend several hours. Equipment: You'll need a blunt needle--those kids' big plastic needlework needles work, or a for real tapestry needle with an eye large enough for your yarn. The yarn you're using, a pair of scissors, a sewing needle, and sewing thread (these latter if the hole is largish). Get yourself a darning egg (which may not be shaped like an egg), or use an incandescent light bulb (which are fast disappearing--so a darning egg is a good investment!). Place it in the sock, centering the round end under the hole. Stretch the knit fabric slightly over the egg. Sit yourself in a comfortable chair with good light, make sure you have your bifocals on, and you're ready to start on an exciting new career....or at least get those socks wearable again! If the hole is really just a thinnish spot, or only one or two stitches are actually gone, you don't need to do much--jump right into duplicate stitch. If the hole is more than maybe 3 stitches by 3 rows, it's a good idea to use a sewing thread to make a framework to hold the stitches you're going to be remaking over the hole. Use a contrasting color to make it easy to see to remove later. If you leave it in place, it could possibly cut through the wool you just stitched over it. Starting at the side of the hole, secure the sewing thread lightly, bring it up near the edge of the hole, and pass it from the bottom of the hole to the top. 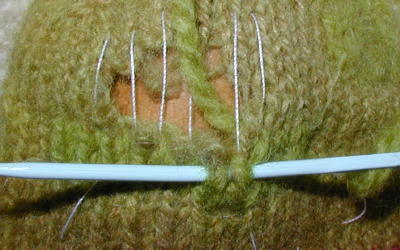 Skip over one stitch width at the top of the hole, and make another pass from top to bottom. Keep repeating this until the entire hole has single threads running up and down between each pair of stitches. Try to keep these threads at the same tension as the rest of the fabric when slightly stretched. If they wobble about, it won't work as well. Secure the end and proceed. Some folks recommend trimming the worn areas away from the edges of the hole. I've been too chicken to do that! I leave the worn areas alone to help guide my needle as much as possible. 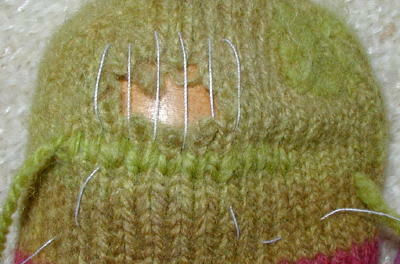 I figure after darning and being worn a couple times, those edges will felt right in with the repair, making it stronger. Thread your tapestry (blunt) needle with up to about a yard of yarn--you can use more, but it might be a pain to manage as you stitch. Starting several stitches away from the worn area, and at least two rows below it (at least the first row of stitches should all be over sound yarn--two rows if the yarn is thin), work duplicate stitch over the knit fabric, leaving a yarn tail of at least 6" / 15 cm that will be later darned in. To do this (a skill I didn't have until I started to mend socks), pick a point to bring up the needle tip from inside to outside (illustrated in the picture above), at the base (bottom of the "V" shape a knit stitch makes) of a stitch. Then look carefully at the V shape of the stitch you're at the bottom of. Pass the point of the needle behind the V point just above that stitch, then out again. Pull the yarn through, being careful of how tightly you pull the yarn--you want the new yarn to sit snugly on the surface of the old, but not crumple the knit cloth. Now pass the point of the needle back into the fabric where it first came out, at the point of the bottom of this first stitch, and bring it out again at the point at the bottom of the next stitch over in the same row. Right handed people can do this most easily right to left, Left handed people probably will find it easiest to work left to right. Watch your tension--yarn, not nerves, though they count too. You want your duplicated stitches to be nearly as possible the same size as the original stitches. They will lay on top of the knitting as it is, making bulkier area than you started with. At the end of the row, going several stitches past the worn area, turn so you're working upside down, still right to left for right handers, left to right for left handers. The motion is a bit different since you're working upside down, but you now have the previous row to help guide your stitches. When your needle passes behind the V to come out again, make sure it goes into and out of the loops at the tops of the previous duplicate stitches. This will make more sense when you actually try it. Keep doing this back and forth. When you get to an actual gap in the stitches, you will understand the pattern that each stitch follows, and you will be able to 'fake' the stitches needed in that area. Tension is important. Don't pull too tightly, or too loosely, or the mended area will distort the cloth considerably. 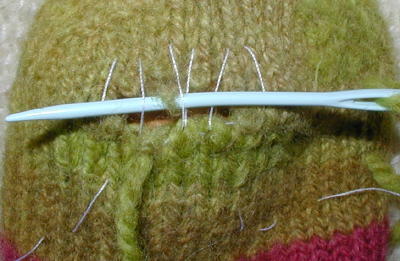 First row working into the hole, showing the needle going through the tops of two stitches from the row below. 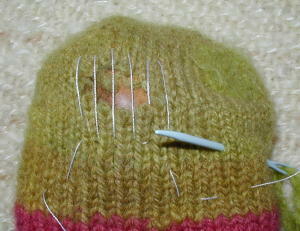 Here you see the needle passing behind the sewing thread framework to help shape a stitch in the middle of the hole. If you have a large hole and you have those vertical lines of sewing threads, you will see that your needle will pass behind a pair of threads to make the top portion of a stitch when there's not the V point of another stitch above it to go behind instead. I find this helps to keep the stitches I'm remaking from pulling out or getting messed up by the time I come back in the next row. 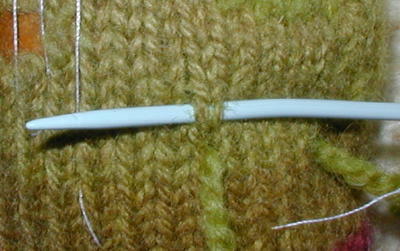 When you have finished the row that reconnects with the knitting at the top of the hole, keep going at least two more rows. This will anchor the repair with 'healthy' stitches so it won't pull out when worn again. 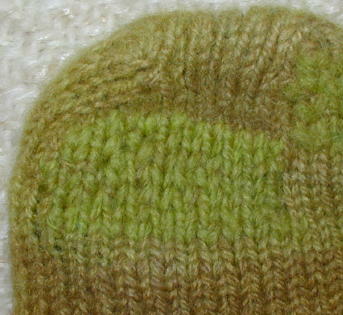 Using this method does make a little thicker area on the sock than weaving back and forth as some references describe. I find it's not a problem. I don't notice the thicker area after one or two wearings, and if I used the same yarn, the darn is quite unnoticeable after that. It is probably slower than weaving, but I like it better. After a while, you will probably need to end off the first piece of yarn and start a new piece. I start and end each length of yarn on the side of the darned area, by working duplicate stitch several times, ending the yarn on the inside of the sock with at least an inch long tail. I find this keeps the yarn end quite secure, and no uncomfortable knots are needed. All this works on gloves, too. I've made repairs on two pairs of commercial gloves. My handspun gloves haven't needed it, but I do treat them more gently. 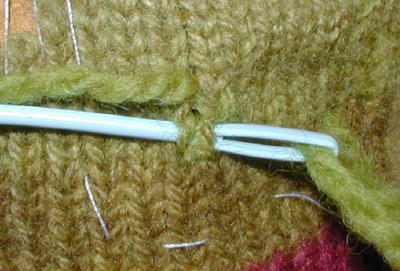 Sweaters and other items could also be mended almost invisibly in this manner. Keep in mind, though, that most likely the yarn in the item being mended will have faded a bit compared to leftover yarn stored out of direct light. If the item is very dressy and important enough to warrant making any repair invisible, you might want to store the extra yarn that may be needed for mending so that it is exposed to about the same amount of light, and wash it with the sweater when it is washed. Some commercially knit items may be knit at too tiny a gauge to repair easily, and it will be very difficult to match the yarn, so choose what's worth your time and effort. My dear husband tore a big, jagged hole in an old pair of Army wool glove inserts (they go inside leather glove shells). I used olive green (what else?) sock yarn to knit a patch which I sewed in place. Not elegant, but works! The gauge of those gloves was just too small, and the hole too large in number of stitches, for me to cross my eyes trying to mend in the way I've described here. 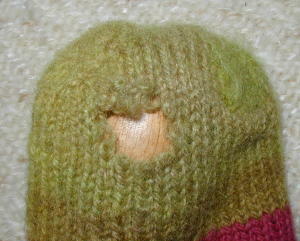 Quite possibly your conclusion at this point is that darning socks just isn't worth your time! 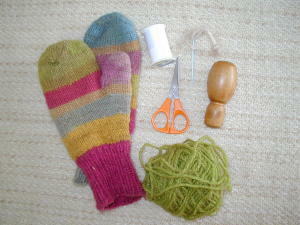 But if the sock was worth knitting, it's worth darning. And with a little practice you'll find it's not too tough to do. Sometimes you may feel like the women in stories and paintings prior to the 20th century, with their baskets full of mending beside them! In our throwaway world, it's nice to have something worth spending a little time to salvage. Certainly socks you've handknit belong in that category!